US, 1986, 99 minutes. Colour. Richard Chamberlain, Sharon Stone, James Earl Jones, Henry Silva, Robert Donner, Martin Rabbett. H. Rider Haggard’s King Solomon’s Mines has been filmed a number of times, in the 1930s with Leslie Banks, in 1950 with Stewart Granger and Deborah Kerr. While this film does take some of its inspiration from Haggard’s novel, it is very much in the line of Indiana Jones films, Raiders of the Lost Ark appearing in 1981. The setting is the First World War, a focus on German occupation in Africa, a German official wanting to get locals to help him to find the mines in order to finance Germany’s activities. His agent is Turkish. Richard Chamberlain is Rider Haggard’s famous hero, Alan Quatermain. Chamberlain had been Doctor Kildare and in many popular films of the 60s, had leading adventure roles in the 1970s including The Three Musketeers, Four Musketeers and The Man in the Iron Mask. Herbert Lom overacts as the German official – and was nominated for a Razzy as worst supporting actor (which he should have won). John Rhys-Davies? thunders and shouts. He was also in Raiders of the Lost Ark. However, this was the first major feature film for Sharon Stone. She had appeared briefly in Woody Allen’s Stardust Memories, a number of supporting roles and television appearances in the first half of the 80s. This film should not have given any producer encouragement to employ her again. However, they decided to produce a sequel, Alan Quatermain and the Lost City of Gold. She gives overacted underacting in both films – and was nominated for a Razzy as worst actress for the Alan Quatermain film. This she also should have won. It is very difficult to see the future suave and possessed Sharon Stone in these erratic and flighty performances. 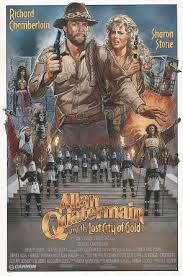 The storyline of Alan Quatermain and the Lost City of Gold is straight Raiders of the Lost Ark. The producers were Menahem Golen and Yoram Globus, the famous Israeli couple who made many action films in the 1980s. The films were made in Zimbabwe, good location photography, with a lot of artificial sets, especially in the second film, sets which resemble those in Raiders. The first film follows the general outline of King Solomon’s Mines, but with 1914-18 there are cars and train trips. There are a lot of African tribes presented, various fights – and a generally superior attitude, even racist, towards the Africans. The film builds up to a climax, many threats for Quatermain and Jessie, a whole range of cliff-hanging episodes which were popular from the weekly serials. With the second film, Quatermain and Jessie are about to be married but Quatermain’s brother is reported as lost. Quatermain decides to pursue his brother, allegedly knowing a lost city of gold. Jessie intends to go back to America, changes her mind, drives perilously close to a cliff edge and comes into the expedition with her usual flighty and bumbling presence. Once again Sharon Stone gives no indication of the star she was to become. Anchoring some of these proceedings is the presence of James Earl Jones, his famous voice used as one of the local heroes. Henry Silva gives an appalling performance as the priest in the city of gold, a black fright wig, terrible delivery, melodramatic performance. The first half of the film is in the King Solomon’s Mines vein, a whole lot of cliff-hanging adventures. However, there is the presence of Swama, an excruciating performance from Robert Donner. In the second half of the film when they discover the lost city of gold, it turns out to be a strange kind of Utopia, with white-garmented white men, women and children as well as local Africans. A high priest has the population in control – and there are two queens, one vampishly bad, the one glamorously good. Once again there are all kinds of cliff-hangers – and a culminating battle. These are matinee action adventures – but not for the discriminating audience.